Four months later, they meet again. Same place, same court, same match-up. Back on Dec. 3 at Ford Field, North Carolina beat Michigan State 98-63, prompting Tom Izzo to claim that UNC looked like one of the best basketball teams he�s seen in his years of coaching. Goran Suton did not play in that game, and though he�s an important part of Michigan State�s roster, that�s not the reason why tonight�s game will play out differently than that 35 point blowout in December. The Spartans will give the Heels a competitive game tonight because UNC is no longer perceived as invincible. At the time of the first contest, there was actually talk of an undefeated season for North Carolina�- and Izzo�s kids bought into that talk. Michigan State backed down in that game, intimidated by the hype surrounding the Tar Heels. A lot has taken place since Dec. 3. North Carolina lost four times against ACC opponents and proved throughout the season that it had weaknesses; most notably, in those defeats, we saw careless defense, poor shooting/shot selection and a lack of intensity. During the NCAA tournament, UNC has seemed to destroy those demons. The Heels have rolled through almost everybody, and struggled only slightly against LSU before beating the Tigers by double digits. Still, don�t be trapped into thinking North Carolina is suddenly invincible. 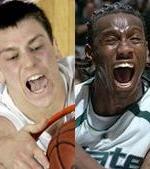 All it takes to scare North Carolina is one punch to the mouth�- and Michigan State has the ability to deliver it. So far, LSU is the only team that went after North Carolina. Michigan State has the toughness to do that as well. The key for the Spartans will be to force North Carolina into its half-court offense. MSU doesn�t need to turn tonight�s game into a Big Ten battle, and the Spartans will surely want to run in transition when they have the ball. However, UNC thrives when it can get easy baskets with Ty Lawson running the break. Lawson is shooting well from three-point range, and obviously Wayne Ellington and Danny Green can stroke it as well from the outside, but those are obviously much lower-percentage shots than a fastbreak layup. As for other keys, North Carolina must force Michigan State to take contested perimeter jumpers, something the Spartans do not want to do. UNC should pack the paint or try a zone to limit dribble penetration and encourage MSU to shoot threes. Also, UNC has to defend Goran Suton�s versatile inside game. He�s the type of guy that can cause headaches with his combination of low-post moves and mid-range shooting. Don�t listen to anyone who tells you that tonight�s National Championship will be a bust. Michigan State, despite its 35 point loss to UNC earlier in the year, will give the Heels a ball game. The crowd, which will be much larger and louder than that Dec. 3 game, gives MSU an extra edge. Tom Izzo�s team seems to have come a long way in the past four months as well. As for a prediction? North Carolina has the type of offense that can overcome a relentless Michigan State defense, and the Tar Heels haven�t had very many intensity lapses during the NCAA tournament so far. The Spartans match UNC�s depth, but when the Tar Heels are playing inspired basketball, it�s tough for anyone to beat them. They may have taken different routes to the National Championship game, but all that matters is that both the Michigan State Spartans and North Carolina Tar Heels are here. North Carolina has looked pretty dominant throughout the tournament and for the most part, the entire season. A hiccup here and a hiccup there, Carolina was one of the most consistent teams this season. The only two facets of their game that has not been phenomenal all season have been their defense and the long distance shooting. Roy Williams� squad has turned the switch on and off all season without the ball and relying on their superior athleticism to light up the scoreboard on a regular basis. However, from the moment the NCAA Tournament started, the Heels have been outstanding on defense, which has made them almost impossible to defeat, especially when Danny Green is on from outside. Michigan State has seemingly bullied their way to Detroit and past Connecticut once they reached the Final Four. Against the athletically enhanced Huskies, Michigan State fed off of 60,000 screaming Spartan fans and ultimately ripped out the heart of Connecticut, pulling away in the final moments. Tom Izzo won the coaching battle as he turned the game into a physical battle, a style very familiar in the Big Ten. Once again, the title game will feature two of the nation�s top coaches. Also, once again, the game could come down to style. The two teams met earlier this season and the Spartans were utterly dominated by North Carolina, however, Goran Suton was not in the lineup due to a knee injury. In that 35 point win for the Heels, Carolina forced 22 turnovers and shot nearly 50% from the field. Needless to say, Michigan State certainly can�t turn the ball over that many times on Monday. For Michigan State to emerge victorious they need to play a slowed down style and not the score get in the nineties, preferably they would like to keep it in the high seventies and low eighties. Kalin Lucas must play Ty Lawson tough and Michigan State must win the battle on the glass, if they get outrebounded and Carolina turns those boards into fast breaks, it will be a long night for home-state fan fan-favorites. But the same goes for Carolina, they need to get those fast breaks and can�t let Michigan State tuen this into a football game. Expect the crowd to be raucous and the Spartans to hang around for the entire game only to fall short in the end due to North Carolina simply being able to make more baskets down the stretch. When the final buzzer sounds, look for the Tar Heels to walk away with the National Championship in an 88-80 victory.